After owning my own business for many years, I’ve worn an array of ­­hats. I hold the new Development Director position, which is a perfect fit to the THINK puzzle of growth. I have been in the marketing and advertising business for 25 years and I’ve run the gamut. From graphic design, consulting, public relations and marketing to digital media, copy writing, video, audio and print production … you name it, I’ve done it. I’m extremely motivated, organized and disciplined. No matter where I’ve been, I’ve produced topnotch work because I am dedicated to making sure each and every piece stands out from the crowd. Whether it’s promotional work for external clients or internal corporate leave behinds, I pride myself on my ability to recognize and articulate a distinct voice for every project. And that’s not always restricted to the written word. I’ve also designed and produced exceptional unique destination promotional videos for various clients. While creative is my passion, web design and development, project management and the gift of being social, is my bread and butter. Keeping on top of projects and making sure all parts get to the finish line at the same time is one thing I do best. The ability to juggle projects and never missing a deadline didn’t only develop through my professional experience; it also comes from having raised three children – all with very different personalities, activities, schedules and demands. It was adapt or die trying. I had to learn to budget my time and my assets, and most importantly, I learned to be flexible and to get things done. I’m proud to be part of the THINK Team where we service clients with professionalism, and more importantly we develop marketing and advertising solutions that drive business. I’ve lived in Washington, D.C., New Orleans, LA Birmingham, AL and most recently Atlanta, GA. I feel like Destin presents some unique challenges to the world of advertising, and all of us at Think can’t wait to jump on board and bring some fresh, innovative ideas to the table. 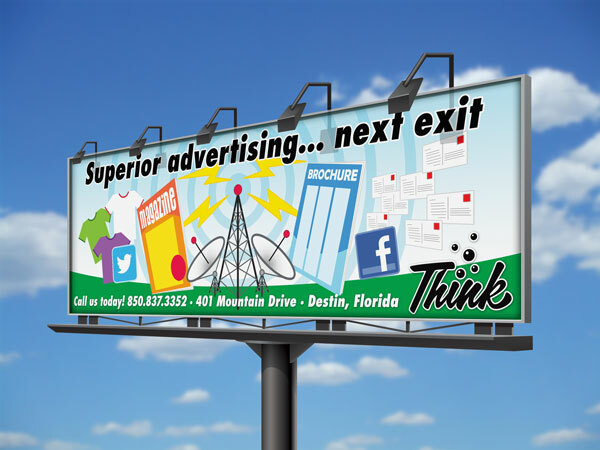 If you’re feeling overwhelmed with advertising your business, let’s schedule a time to discuss the possibilities. Many people don’t realize that advertising comes in all shapes and sizes. I would love to help develop your marketing and digital needs…So let’s talk soon!